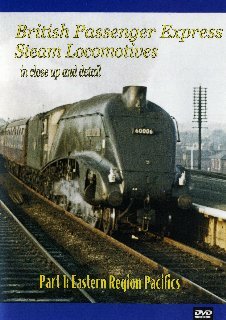 Using rare archive still photographs and cine film footage, this is one of a series of programmes looking back at the heyday of British Steam. With narration by Nigel Fletcher, part 1 looks at the A1, A2 A3 and A4 locomotives of the Eastern Region of British Railways, and features an exclusive interview with Peter Townend, one time shed master at Kings Cross shed. This disc effectively provides two programmes for the price of one. Visually, it takes the form of still photographs and a brief description of a large proportion of the ex-LNER Pacific fleet. Aurally, it provides fascinating interviews with ex-Kings Cross shedmaster Peter Townend and other steam age characters including Richard Hardy, interspersed with a sizeable number of rare colour film sequences depicting members of the classes A1 to A4. This DVD is a useful record put together with obvious feeling by the compilers.